Click in the geologic map to zoom in and view more detail. W.C. Johnson,  2011, Surficial geology of Kearny County, Kansas; Playa deposits and Arkansas River terrace deposits by W.C. Johnson and T.L. 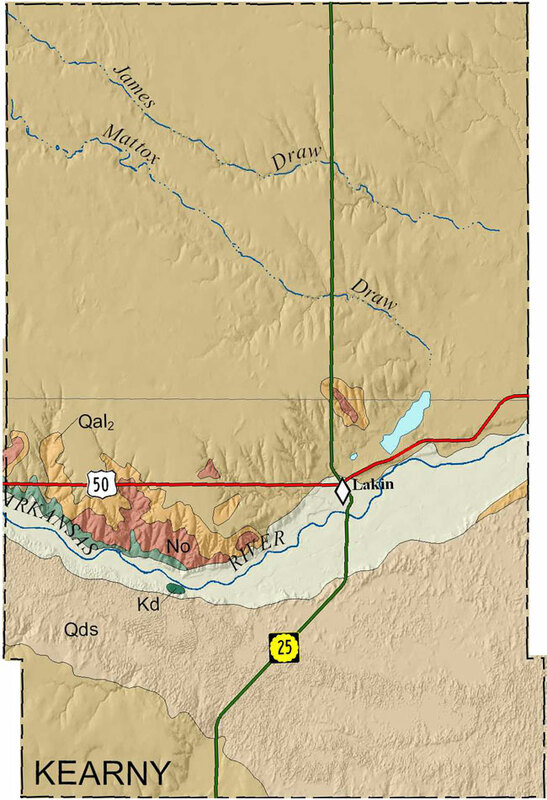 Woodburn: Kansas Geological Survey, Map M-62 (revised), 1 sheet, 50 x 44 inches, scale 1:50,000. Paper copies of the complete map (with stratigraphic column and legend info) are available from the Kansas Geological Survey, 1930 Constant Ave., Lawrence, KS 66047 (or phone 785-864-3965) and at 4150 W. Monroe St., Wichita, KS 67209-2640 (phone 316-943-2343). The cost is $15.00 plus handling and sales tax. The Kansas Data Access and Support Center (DASC) has ArcInfo coverages available for this geologic data.